January 19, 2016: Dr. George Wallerstein (University of Washington) has requested AAVSO coverage of the long period/symbiotic variable R Aquarii beginning immediately in support of high resolution spectroscopic observations planned for 2016 January 19 and 21. Several other astronomers, including Drs. Lee Anne Willson (Iowa State University), Ulisse Munari (INAF, Astronomical Observatory of Padua, Italy), and Fred Walter (Stony Brook University) are studying R Aqr closely and additional spectroscopic and other observations are planned for the near future. R Aqr is an extremely interesting system. Its type is both Mira (M) and symbiotic (ZAND) - it is a close binary system consisting of a hot star and a late-type star (the Mira), both enveloped in nebulosity. As a result, the very interesting light curve shows not only the Mira pulsation but also complex eclipse behavior as the two stars interact. The period of Mira variation is 387.0 days; the eclipse period is 43.6-44 years. The cause of the eclipse is unknown; several theories have been proposed, including a focused accretion stream, a disk or cloud around the secondary, and a triggered mass loss that produces an opaque cloud. Careful investigation of this upcoming event should help to resolve this question. The last eclipse of R Aqr was in 1978. The next eclipse is predicted for 2022, but may be early. The current behavior of R Aqr suggests that the eclipse, which lasts for several years, may either be beginning or its beginning may be imminent. R Aqr was at minimum in early December 2015 at magnitude V=11.4, and is currently at visual magnitude 11.0. During this phase of the approximately 44-year eclipse cycle, at maximum it may be as bright as V~6.0-6.5 but is not expected to become brighter. Beginning immediately, nightly BVRI CCD and DSLR photometry and visual observations are requested. As R Aqr brightens towards maximum and is in range, PEP observations are also requested. Ongoing spectroscopy over the next several years will be interesting to see as the system evolves throughout the eclipse. For more information on this unusual close binary, please see the AAVSO Variable Star of the Season article on R Aqr written in 2003 by AAVSO Technical Assistant Kerri Malatesta. Please note that this VSOTS article includes a long-term AAVSO light curve for R Aqr. An updated recent light curve that overlaps this long-term light curve is below. AAVSO light curve of R Aqr March 2001-January 2016 (JD 2452000-2457405). 210 observers worldwide contributed 3,443 observations to this light curve. 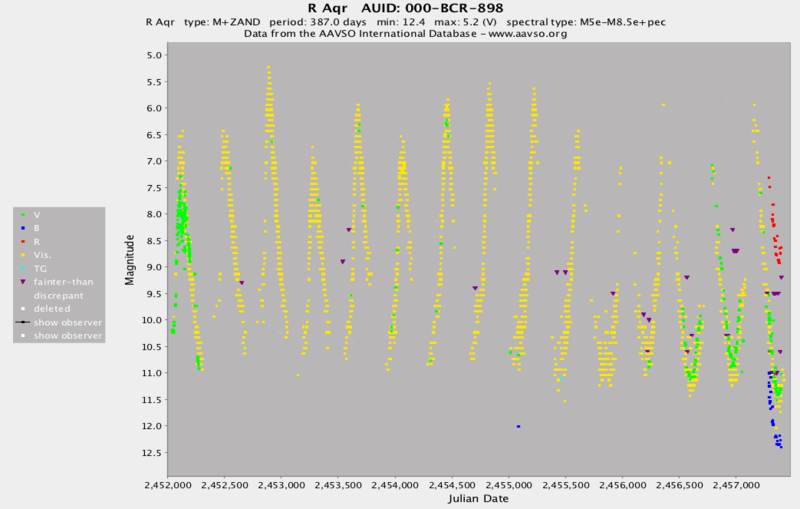 Please report all observations to the AAVSO International Database using the name "R AQR".